As part of the Charity Run organized on the occasion of the Memorial Year of Reformation, forty employees of the Bethesda Children's Hospital, with the help of the Christian Health Centre in Munkács, examined the residents of the Reformed Elderly Home in Nagydobrony and the Catholic institution in Rát in the last week of September, as well as children brought by their parents to the screening tests. "We've received so much over the years that we felt we should give something back," said György Velkey, the director of the Bethesda Children Hospital, about the program. The doctors from Sub-Carpathia and Hungary make decidions on the treatment of sick children after consultation. Following the examinations, a care plan will be made, which will be coordinated jointly and, if necessary, the children will be treated in Hungary. At the press conference on the 30th September, an agreement was signed by György Velkey and Snicer Román, the Head of the Sub-Carpathian County in Munkacsevo (Munkács), by which the continuing education and patient consultation program could be continued. The foundations of this work have been laid over recent years by the personal and professional contacts between the staff of the two institutes and with the help of the American S.A.R.A. foundation. 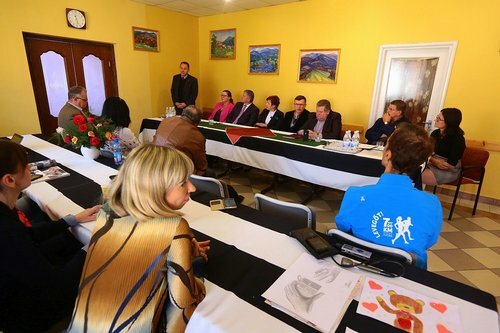 In recent years, Hungarian health care leaders have been in close contact with hospitals and institutions in Sub-Carpathian. As a result, many patients, including children, have treatments financed by the Hungarian government, by the Hungarian social security or by charity, especially through church organizations. The relationship between the Hungarian experts and the Beregszász District Hospital, The Children's Hospital of Munkács and the Christian Health Centre in Munkács is particularly strong. István Grezsa, Government Commissioner for the coordination of development tasks in Szabolcs-Szatmár-Bereg County and Subcarpathia, was pleased that this agreement connects Hungary and Sub-Carpathia, both Hungarians and other nationalities. "Instead of the serious conflicts between the two states, we should focus on the programs that connect us" and he also said that future investment in infrastructure would be needed to bring Ukraine closer to the European Union. Erzsébet Bíró, deputy head of the Sub-Carpathian Health Department recalled that in recent years, Hungary has been a strong supporter of Sub-Carpathian education, and is now paying similar attention to medical institution. "I hope that this work will continue and will contribute to keeping Hungarian healthcare workers here, and the people in need of care will feel that health care can be found right here too.” According to Pál Oroszi, Medical Director of the Christian Health Centre at Munkács, it is a great pleasure that in the anniversary year of the Reformation, "The Children of Reformation" program will start initiatives that serve the people of Sub-Carpathia. Hanna Pava, Deputy Director-General of the State Health Supplementary Centre added: the agreement also contributes to up-to-date professional skills in the region, aiding effective treatment. “I would like to thank Hungary for helping in the difficult situation," said Roman Snicer, Head of the County Children's Hospital in Munkacsi, at the signing of the agreement. “In Sub-Carpathia, the different nationalities live in peace, which is maintained by such efforts. Patient care is based on professional consultation and helping one another, where doctors support each other with all possible means.” The agreement is focused on opportunities for further training and cooperation on patient care. In further education, the American S.A.R.A. Foundation also plays a large role, and has already supported the Bethesda Children Hospital in Budapest and the hospital in Munkács. By the help of this Foundation, doctors will be able to take part in professional trips to the US where they can get to know the health care systems there.